easily placed inside your open fire. It is also suitable on your coffee table or outside on the terrace. 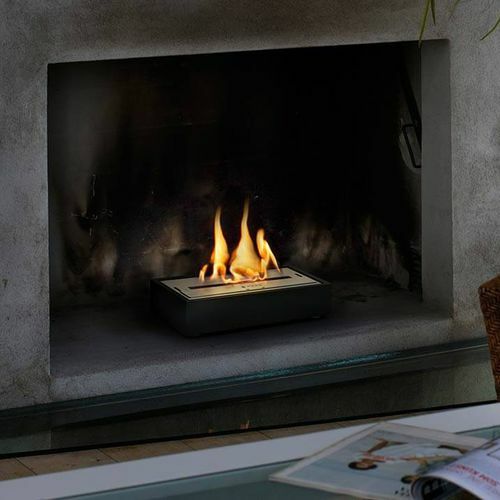 OF Wide is an ethanol burner full of possibilities. This is an ethanol burner for those who are tired of smoke, soot and ash from their wood-burning open fireplace. You can convert your open fire into a fireplace that runs on ethanol whenever you want without the need for any installation. And when you want to burn wood, it is easy to lift out the burner. A convenient and easy way to enjoy the new environmentally friendly technology. Burner with absorbing function for unprecedented safety. No installation required – just put in place. Converts existing wood –fires to ethanol power. OF Wide has extended flame width.